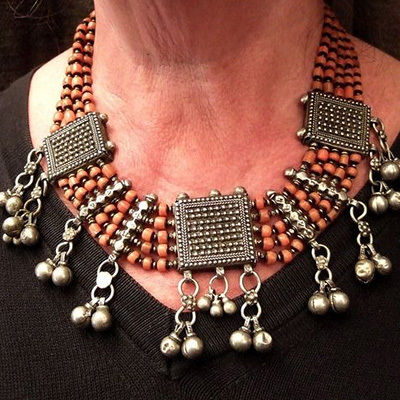 The HALTER House is an international reference in ancient ethnic jewelry. ever more varied range of rare and sought after pieces. A beautiful pair of silver, gilded, coral and turquoise earrings from Bukhara, Uzbekistan dating from early 20th century. 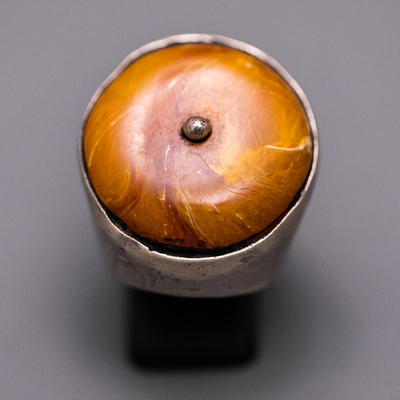 This beautiful writting intaglio on a wonderful agate is set up a silver body whose I like especially the foral work. From Iran, it dates from the early century. A beautiful pakistan pendant ornated with a nice spinel stone ... the closed setting and the small nice granulations make this pendant a very nice ornament ! A very nice an wearable silver bracelet dating from early 20th c. coming from India (Maharasthra and Gujarat). This type of bracelet was exclusively worn by Rabari women. 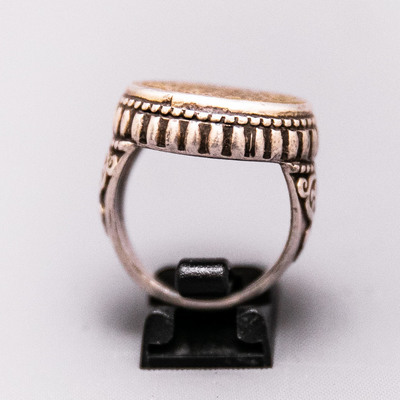 A typical Touareg ring in silver and copper dating from the 19th century is originating from Mali (Sarakole). The motifs are inspireted by card game. 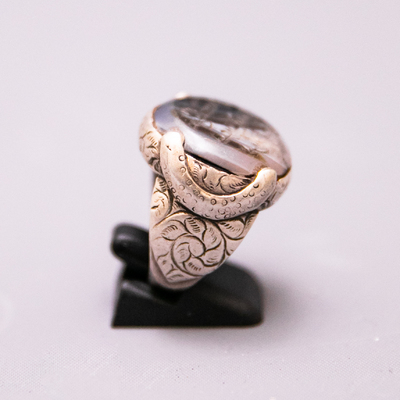 A magnificent stamp ring, early 20th century, is made in silver and copper ... the inscriptions are probably the name of the owner and made for signing documents. 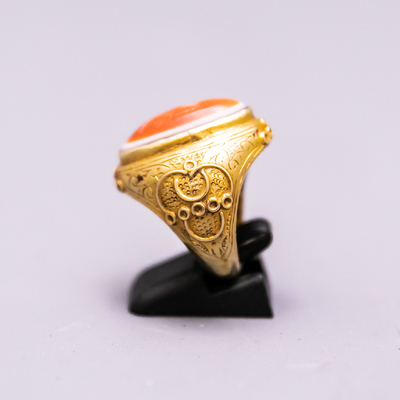 A pretty ring in 22 ct sold gold ornated with an eye agate representing a bird ... The body of the ting very refined ornated with a beautiful granulation and the god eye, wich brings luck, is from Iran et dated from early 20th century. 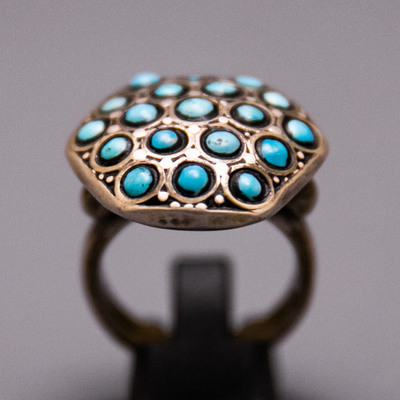 This beautiful and elegant silver ring ornated with turquoises from Iran, so from the best quality, dates early 20th century. 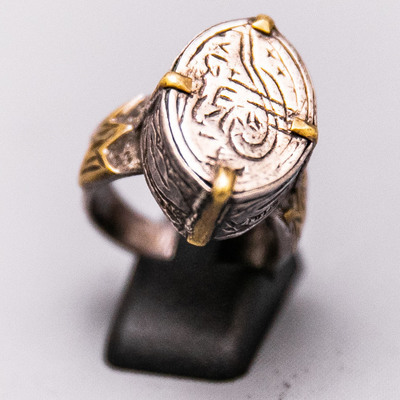 This pretty ottoman silver ring showing the stamp of Suleyman the magnificent is ornated with gilded copper craws. It dates early 20th century. 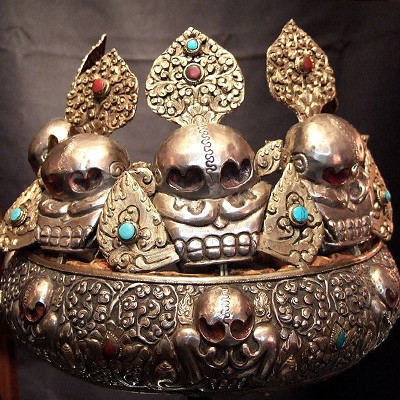 A beautiful G'au (travel box) from Nepal: this "Buddhist" box is supposed to protect its owner from evil spirits ... This type of refined G'au (filigrane gilded silver, various stones - turquoises, lapis, coral, ...). These ornaments dating from the '60s of great precision were often intended for export. Here, homage is paid to Hanuman, the Monkey God. In Nepal, Hinduism, often described as Hymalaian, borrowed much from Tantric Buddhism. Inside the box, another sculpture representing the sitting Buddha. 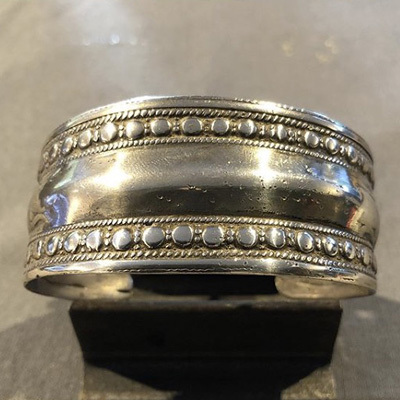 This ring in silver is extraordinary because of the central bead called “dZi bead”, bead coming from Tibet and other himalayan areas supposed to have a protected power on the carrier. 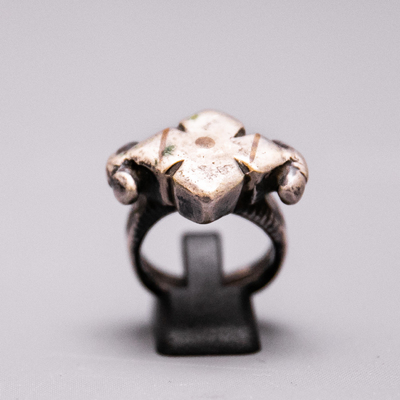 This ring comes from Iran and dates from early 20th century. 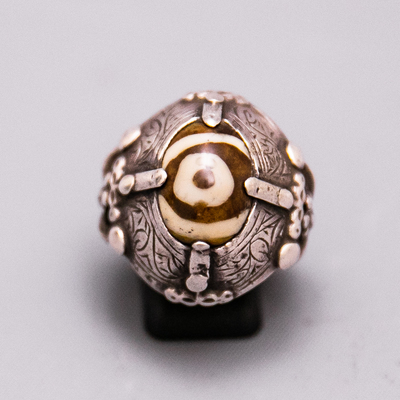 This silver ring with a wonderful bead in amber goes as well to the man or woman. Its comes from Tibet and dates early 20th century. 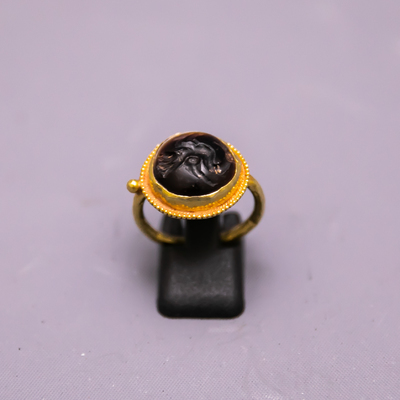 A very nice ring in 22 ct solid gold ornated with a pretty eye agate with a intaglio representing a warrior. From Iran, it is dated from the early 20th century … Look also the beautiful work on the body of the ring. 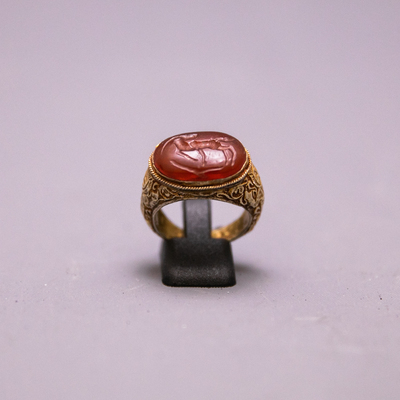 A splendid ring in 20 ct solid gold from Iran ornated with an old intaglio in cornaline representing a “mythical” cervidae. The body of the ring is finely chiselled ... from the end of the 19th century. A nice old (early 20th c.) ring in silver and gildingswith a good quality square lapis lazuli ... Found in Kabul in Afghanistan ... Nice ingravings all around the body of the ring. 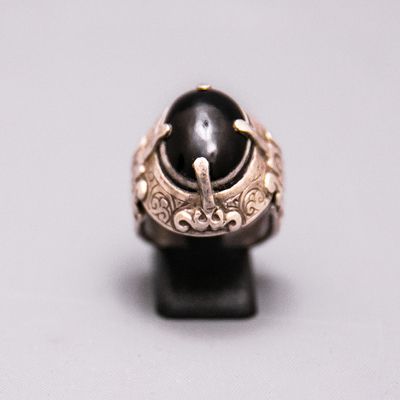 This wonderful ring ornated with a black eye agate set on a silver body with beautiful design dates from early 20th century, Safavide period, is coming from Iran. 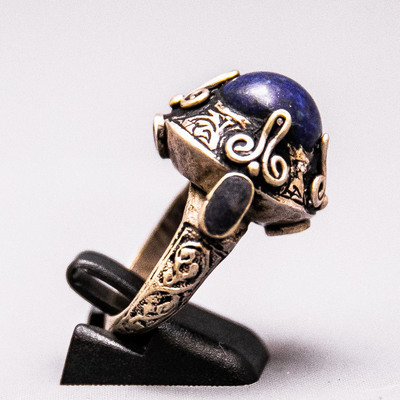 This splendid silver ring is ornated with a magnificent bead in lapis-lazuli coming from Afghanistan is originating from Iran and dated from early 20th century. The body of the ring showes a beautiful design. Our collection of necklaces, rings, earrings and bracelets, from around the world, will delight fans of extraordinary ethnic pieces and patinated by time. A variety of unusual collectible and decorative items from other cultures (Shamanic or ceremonial masks, saddles, headdresses, belts, swords and various objects of all kinds, from Central Asia, Far East, of the Indian continent and Amerindian items, even from some countries of North Africa, sub-Saharan and Ethiopia etc. ...) that join the spirit of the Cabinets of Curiosity. Long located Galerie du Roi in the center of Brussels, Maison Halter now welcomes you in its showroom in the upper part of the city. Michel Halter invites you to make an appointment at your convenience on +32 477 609 613 to present his exceptional collection of ethnic jewels patinated by time.